Do you have tough areas of fat that just won’t go away? Love Handles? We can help! WHAT IS ULTRASOUND CAVITATION ? Cavitation is a relatively new aesthetic treatment. Using leading edge technology it converts fat cells into liquid which can then be naturally drained by the body’s own natural filtration system. Generally one fat cavitation treatment lasts 25 – 30 minutes where a single part of the body is treated. 72 hours must pass between each session so that the body can eliminate the fat. 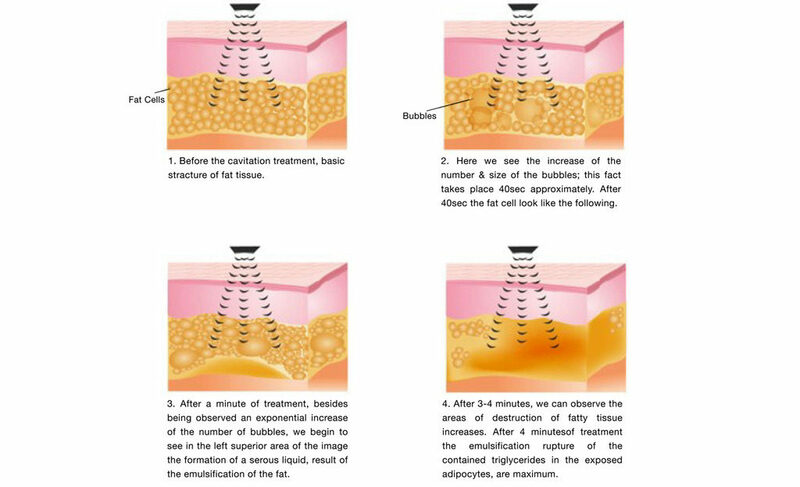 The minimum suggested number of fat cavitation sessions is between 6 and 10. Drink at least 1.5 to 2 litters of water a day a week before your treatment. Choose an area you wanted to treat and start moisturizing that area thoroughly everyday and at night. Hydration will help make the treatment a lot more successful.